'This Could Hurt' by Jillian Medoff. 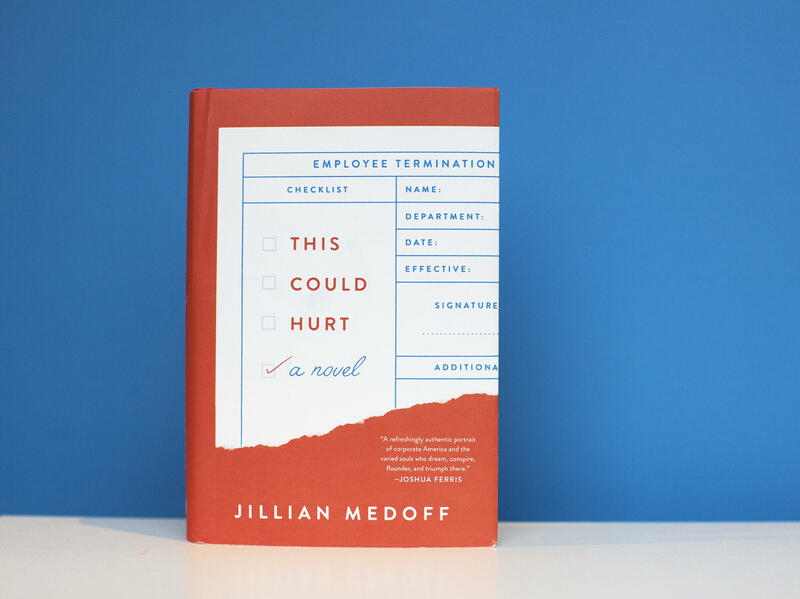 Jillian Medoff's new novel is an office dramedy involving an elaborate coverup in a corporate HR department that has nothing to do with financial or sexual transgressions. In other words, it isn't ripped from the headlines. Set at a New York-based market research firm that's been cut to the bone by layoffs in the wake of the 2008 financial meltdown, This Could Hurt is an ultimately heartwarming entertainment about the ways "the work/life firewall" breaks down when a formidable boss — a 64-year-old glass-ceiling-breaker who's both Hispanic and a woman — starts to slip. In comparison to recent scathing workplace fiction like Joshua Ferris' Then We Came to the End and Daniel Orozco's story "Orientation," Medoff's novel is more earnest than satiric. Like Tom Rachman's The Imperfectionists, its strength lies in its motley crew of flawed but relatable characters — the staff who are left clinging to their jobs amidst all the downsizing, while also coping with personal lives that leave much to be desired. Medoff has worked for decades as a management consultant in corporate communications — employment which she says has provided the structure, discipline and stability she needs to write novels — and in this case, the material. She obviously knows her subject cold. At the heart of This Could Hurt is Rosalita Guerrero, a character Medoff clearly loves. A demanding but galvanizing torchbearer, her work is her life. Among the tradeoffs she's made for her brilliant career: A family. Rosa, Medoff writes, understands that "A business unit was not a family — period. Yet what fueled an employee's success, and in turn, the company's, were the very qualities that bound a family: loyalty, diligence, humor, grace." But despite having no children of her own, Rosa is a mother hen who, armored in St. John suits and Chanel Rouge Noir lipstick, fights hard for her employees. Among her specialities: "a lot of experience helping immature men find direction." When a medical condition compromises her abilities, these men — along with a couple of spectacularly capable women — band together into a workplace family to pay her back by covering for her. The narrative bounces along briskly between Medoff's cast of challenged corporate deputies, though it's occasionally slowed by redundancies when we get the same story from slightly different perspectives. There's Rob Hirsch, a "43-year-old slacker in baggy Docksiders and brown sweater vest" who brings "lethargy, apathy, [and] a marked lack of concern" to his work as a recruiter. Rob, although still in love with his wife of 14 years, has a benign flirtation going with his office spouse, Lucy Bender, a hardnosed VP in charge of communications and policy who turns out to be the wrong person to trust. Medoff has fun contrasting eager, ambitious, and "very, very bossy" Lucy — who loves "being large and in charge" — with listless Rob. She comments sharply, "The gender wars could be summed up in one sentence: 'Okay, I'll take it on.'" Another of Rosa's loyal minions is Leo Smalls, lonely at work and home, struggling with the heightened challenges for gay men in the corporate world. And then there's 34-year-old Ken Verville, a job-hopping Wharton grad who's the less driven and fulfilled half of a black power couple. Medoff plays much of this for laughs, including incisive jabs at the corporate equivalent of the social air kiss — hugs in which only upper arms come in contact — and the floppy bow blouses of "the worst period of women's business attire," which she contrasts with the appalling new era of flip-flops and beach cover-ups. But she hits her serious themes even harder, and This Could Hurt is far more tender than caustic. That title line, by the way, is how Rosa braces employees for the ax, but she follows it quickly with the reassurance that "Every new job is another chance to reinvent yourself." Yes, it's a bit sappy, but let's not knock compassion. Ultimately, Medoff's book is about finding oneself — and satisfaction — in a combination of absorbing work and personal relationships. In addition to kindness, Rosa ingrains this idea in her acolytes: "The key is to be the same person at home and at work."